A great expansion, and a promising sign of things to come. Issues aside, Heart of Thorns is a clever addition to one of the best MMOs around. What is it? The first, jungle-based expansion for Guild Wars 2. First things first: Heart of Thorns isn't going to change your mind. If you don't like Guild Wars 2's fast-paced, streamlined combat or distinctive, freeform end-game—some people don't, I have read the internet—this first expansion won't magically make ArenaNet's approach more palatable. If anything, Heart of Thorns reassesses and restructures everything that has come before. It moves Guild Wars 2 into more expansion focused phase. It's new, but also the same. I do like Guild Wars 2. According to the game, I've spent 728 hours playing it. 30 days. That's a long time. A whole rabbit could gestate in that period. Or 1/9th of an entirely new human. Despite that, I hadn't played much over the last few months—my interest waning due to the lack of new content updates in the lead up to this expansion. Heart of Thorns has, for the most part, rectified that. It's an enjoyable chunk of entertaining new stuff. Some quibbles aside, it makes Guild Wars 2 feel exciting and relevant again. The expansion introduces four new maps in Magus Falls, the area west of the Asuran capital city of Rata Sum. It's a new, primarily jungle-themed region. Picture the Sylvari home of The Grove and Caledon Forest, but darker, less vibrant and more dangerous. Gnarled trees wind up and around. cliff formations hide labyrinthine, underground warrens. Ancient, golden architecture gleams out of dark, foreboding vegetation. It's frequently beautiful and occasionally gorgeous. As in Guild Wars 2, ArenaNet's art team has done an exemplary job—taking a basic theme, and filling it with interesting ideas. The initial exploration phase is a joy. Frequently, I'd be heading to a specific point, only to be distracted by an area that looked fresh and intriguing. During my first visit to the Tangled Depths, a crack in an otherwise plain corridor led down to a wondrously surreal underground expanse. In fact, the Tangled Depths map as a whole is, visually, an absolute treat—a fascinating intersection between lore and design. Winding paths above ground feed down into cavernous passageways, and again down further into much stranger depths. I won't spoil what's down there, but it's a nice surprise for fans of Tyria's history. It's almost a shame that the area looks so good, because in every other respect it's my least favourite part of the expansion. It's confusing to navigate, and filled with enemies that tip past challenging and into infuriating. It was during a fight against one such enemy—a Champion tier bug-thing—that I punched my keyboard in such a way that my computer shut itself down. It was easily my most dramatic accidental ragequit. These issues will probably be lessened as I grow more familiar with the area, and once I've unlocked all the traversal methods it requires (more on that later). But the other areas feel more instantly and intuitively navigable. Four maps might sound slim for an expansion, but they're big, multi-layered affairs. Verdant Brink, Heart of Thorns' first map, has you move between the canopy, the floor and the jungle's roots. Bits of the roots, at least. The majority of the undergrowth is a pulsating, deadly mass. As in Guild Wars 2's other level 80 areas, there are no Renown Heart quests—Guild Wars 2's version of, well, quests. Instead, each map is made up of a series of public events that scale based on the number of people who participate. Many are comprised of multiple stages that ultimately build into a map-wide metaevent. In Auric Basin, collaborating to activate multiple pylons in each quarter of the map results, eventually, in a huge boss-fight. In these moments, the entire map must work together to jointly take down their section of the boss—using the map chat to organise, plan and execute on the fly. It often fails, but sometimes everything comes together and your hard work pays off as the map's population congregates in the centre for their rewards. It's also a clever approach to MMO design in general—highlighting the massively multiplayer aspect in a way that makes other players a welcome sight, rather than an irrelevance or, worse still, a hindrance. Guild Wars 2 has always done this, but Heart of Thorns draws on ArenaNet's experiments across the last few years of updates. The new maps feel like a logical extension of the approaches found in last year's new zone, The Silverwastes, or the time-limited Twisted Marionette and Escape From Lion's Arch events from the season before. Unusually for an MMO expansion, Heart of Thorns doesn't raise the level cap. It doesn't add any new tiers of gear, either. If you were level 80 before the expansion, you're still at the maximum level now. If you were fully kitted out in ascended armour before the expansion, you've still got the best equipment now. XP gains instead go towards unlocking bonuses in the new masteries system. Masteries are a little complex, but they're central to Guild Wars 2's reworked progression. There are four mastery tracks for the Heart of Thorns region, each containing multiple unlocks. By selecting a track, you start earning XP towards it—your progress displayed at the bottom of the screen where the levelling bar used to be. Earn enough XP, and you can purchase the unlock with Mastery Points gained through specific achievements, or collected throughout the new zones. Heart of Thorns' masteries offer a wide selection of benefits. The gliding track, for instance, enables a hang glider that can be deployed at any time. Later masteries in the track let you ride 'updrafts' found across the new maps, or give unlimited endurance to prevent you from unceremoniously falling out of the air. Other tracks unlock access to specialised merchants, specific daily challenges, warp gates, hidden shortcuts, etc. To unlock all masteries, you'll need 49,530,000 XP. That's a shitload of events. The further into a track you get, the more expensive the masteries become. The first unlock on the gliding track requires 508,000 XP—about twice what it takes to level from 79 to 80. The last, that lets you glide along ley line energy, costs 4,318,000. To unlock all of Heart of Thorns' masteries, you'll need to earn 49,530,000 XP, or about ten times the amount required to fully level an alt. In layman's terms, that's a shitload of events. The Guild Wars 2 community is—and I'm being diplomatic here—conflicted about this fact. But there are a few things that lessen what could otherwise be a serious grind. Firstly, masteries are account bound. Unlock them for one character, and they're unlocked for all. As with many of the systems introduced to Guild Wars 2 over the last couple of years, it's extremely alt-friendly. Secondly, most masteries are pitched as quality-of-life upgrades. Most of the ones that unlock traversal options are lower down their respective tracks. Even now, after a week of play, I can glide, ride updrafts and use bouncing mushrooms. I can happily navigate most of each map. Despite this, the implementation isn't perfect. In places the balance feels off. As previously mentioned, ley-line riding is the final unlock of the gliding map, and, without it, there are areas locked off to me. I like exploring, so I balk at the idea of missing out on places because of the high cost to reach them. Worse still, it's not clear which masteries are required to unlock specific activities. I'm currently stalled in my personal story because I didn't have the prerequisite mastery. It's not prohibitively expensive, I just didn't know I needed to have it. These issues aside, I like the system. Guild Wars 2 needed a new form of progression, and, without new tiers of gear, this fits the bill nicely. Part of the reason I stopped playing was that everything I needed to acquire seemed a long way off. I didn't have the materials required to craft ascended armour, or forge a legendary weapon. I was stalled, and facing a long road to any meaningful progress. This reintroduces it, both within the expansion itself and in the main game. There's a separate set of mastery tracks for the base game; including increased Fractal rewards, ways to mentor new players, and—at long last—a guaranteed way to earn the precursors that are required to craft legendary weapons. More importantly, the new traversal methods feel great. The hang glider is a joy to use, and feels so natural that I miss it outside of the expansion maps. I have, on more than one occasion, come close to hurling myself off a cliff—only remembering at the last second that the glider won't deploy. It's a particular problem on the new World vs World map, which is a clever piece of design that utilises special shrines to encourage teams to defend their territory. It also has lots of massive cliffs, and I desperately want to glide off of them. The second new progression system in Heart of Thorns unlocks your character's specialisation—a new trait line that lets each profession wield a new weapon type, and utilise a new mechanic. These traits are unlocked by earning Hero Points that are specific to each character. Hero Points are unlocked in bundles of ten by completing specific challenges found throughout the new maps. I /was/ planning to write about the effort required to fully unlock a character's specialisation trait, but the developers, who have been diligently patching and tweaking the expansion throughout the last week, went and reduced the total number of Hero Points needed from 400 to 250. One minute I was facing a long, arduous journey. A patch later, I'd filled it all out. I'm glad, too, because it's great. I play a Thief, whose specialisation is Daredevil. I can still utilise stealth, but the focus is now on endurance—so much so that I've gained a third consecutive dodge roll. I can also customise my dodge to apply a series of crippling conditions, or grant a selection of handy buffs. I've been playing a glass cannon DPS build since the game launched, and so increased evasion is relevant to my interests. Also, I get to thwack things with a staff. It's all extremely gratifying. I've heard first-hand accounts of similarly enjoyable specialisations, but also that some are more situational. Take the Druid, the new specialisation for the Ranger. It's closer to a support class, designed to help buff and heal allies. Hopefully it won't result in difficult group content relying on a designated healer to get them through. 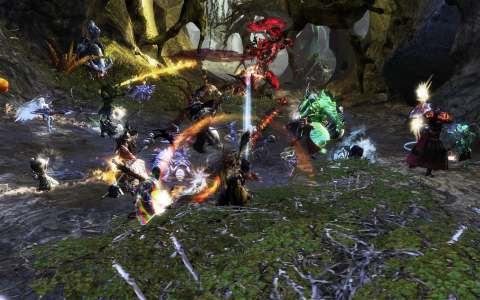 So far, Guild Wars 2's combat has been predicated on the idea that players must largely look after themselves. I suspect the community at large has been more forgiving and friendly because of that fact. The other reason the reduction in Hero Point cost was helpful is because getting them was hard. In fact, much of the expansion is. Things that would have been soloable in the base game now encourage the formation of ad-hoc groups, from the event-based map movement to the many Hero Points that spawn Champions. For the most part, I enjoy the difficulty spike—after years of steamrolling through the open world, it's a welcome change to have to call in reinforcements through map chat. But some of the new enemies are better than others. I love the design of arrowheads—hulking reptiles that can down my squishy Thief in a single, powerful attack. They're bulky, slow, and have an attack pattern that rewards those who can respond to and evade its telegraphs. Some beasts, however, aren't as interesting to fight. Smokescales emit an area-of-effect mist that, as long as it remains in that radius, temporarily causes all attacks to miss. They're not even particularly tough, just an inconvenience. After years of steamrolling through the open world, it's a welcome change to have to call in reinforcements. This review isn't an exhaustive attempt to dissect each of Heart of Thorns' new features. Rather, it's an exploration of what, after a week of play, strikes me as the most notable parts of its design. There's lots more going on: from a storyline that finally adds a little tension to the previously saccharine cooperation between the playable races, to the new Revenant class, who gains versatility by drawing on the aspects of historical legends. There's a new PvP mode, a reworked Fractal system, and 'Adventures'—a series of repeatable, score attack challenges. Still, it's possible to look at everything Heart of Thorns offers and wonder if it justifies the £35/$50 asking price. I'm not really worried. Guild Wars 2 doesn't have a subscription, and yet it was one of the most generous MMOs around in terms of post-launch content updates. It sounds as if ArenaNet is planning to give Heart of Thorns the same treatment, starting with the game's first raid. That's an exciting prospect, because it's easy to see how Heart of Thorns restructures Guild Wars 2 towards future expansions. From here, ArenaNet has a way to develop sideways into broader options, and so keep the base progression intact. Put another way, I've already logged over 700 hours with my Thief. Having played Heart of Thorns, I can see myself playing many hundreds more.